High-quality teaching is central in creating an educational environment that supports learning for all. In designing, implementing, evaluating and scaling teacher training programs as a pathway to shaping education systems, design a cost-effective model that adopts a streamlined, appropriately sequenced approach to influencing how and/or what teachers teach. Shift towards a long-term focus to improving the effectiveness of the teaching force by being intentional about whom you train, leveraging both intrinsic and extrinsic motivators, and engaging both government and pre-service teacher training as key partners. 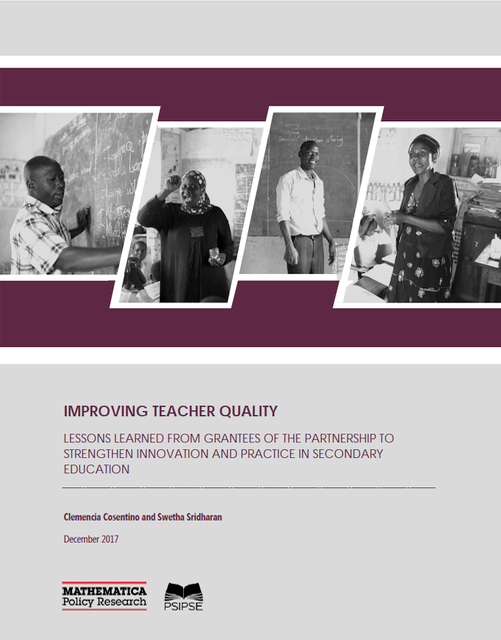 These and other practical, cross-organizational learnings and concrete examples highlighted in the study offer concrete guidance that can be leveraged to strengthen the design, implementation, evaluation and scaling of interventions to improve the quality of teaching. Over the past five years, PSIPSE donors have invested more than $18 million in eight projects run by nongovernmental organizations (NGOs) to improve teacher quality. These NGOs are testing strategies to sharpen teachers’ pedagogical skills, mostly in East Africa. The NGOs’ experiences yield several insights for practitioners who want to design scalable interventions for cultivating teacher quality. This brief draws on these insights to offer 10 concrete tips on designing an intervention, partnering with key stakeholders, and motivating teachers. An infographic of the 10 tips can be found here. Mathematica undertook an initiative-wide monitoring effort, “The PSIPSE: 2016 Monitoring Results,” to take stock of ongoing PSIPSE interventions and identify areas for improvement. The findings reveal positive early returns on program activities and suggest how international secondary education program implementers and policymakers can promote positive outcomes in the future. This review summarizes the findings from a growing body literature, focusing on rigorous studies that quantify the magnitude of the impacts by using a credible comparison group to isolate the effects of an intervention from (1) other changes in the prevailing environment that occurred over time and (2) pre-existing differences between groups. Drawing on previous systematic reviews, updated with recent additions, we highlight what is known and identify the gaps that remain. Mathematica Policy Research started working with the PSIPSE in late 2014 as its learning partner. In this brief, we share our independent analysis of the PSIPSE approach to effecting change in secondary education—starting with the partnership’s theory of change, countries of focus, and interventions supported. We end by presenting the monitoring, evaluation, and learning (MEL) framework developed for the PSIPSE and distilling some implications of our analysis for the future. The following reports speak to the promise held in expanding educational opportunities at the secondary level in developing countries. These documents make clear that while gains in enrollment have been significant, access continues to be a challenge acutely felt in particular regions and countries of the developing world and that gaps persist in the quality of learning. "Forging a New Deal in Education"
"How a Non-for-Profit Venture Like Avanti is Taking IIT Graduates Back to Classrooms"
"In India, Revealing the Children Left Behind"